The books I’ve read over the past few months have explored several of Tanizaki’s favourite themes (such as erotica and the influence of the west), but one important focus, a fascination with the past, hasn’t really come up. Today’s choice, though, remedies that omission, featuring a couple of works where the writer blends fact with fiction in using old tales to create intriguing glimpses of his country’s history. 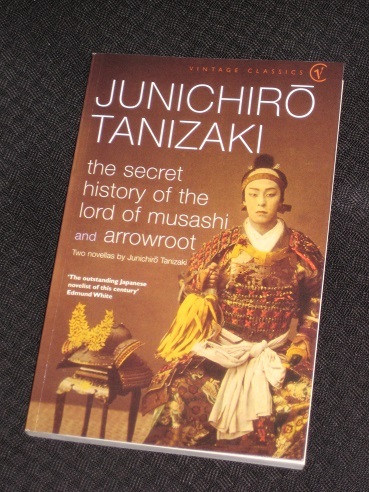 The longer piece, The Secret History of the Lord of Musashi, is an impressive novella recounting events from the sixteenth century, and it’s supplemented here by Arrowroot, a shorter tale set at the start of the twentieth century (both translated by Anthony H. Chambers). The two works are different in tone, but what connects them is the style of writing and their use of ‘historical’ sources to pull the story along. Arrowroot is a gentle account of a journey the narrator took to Yoshino, a famous sightseeing area in Nara Prefecture, some twenty years before the telling of the story. Seeking inspiration for a novel, he decides to follow in the footsteps of some historical (and mythical) figures along an almost inaccessible river. Long intrigued by the history of the ‘Southern court’ (with its own rebel Emperor), he hopes his visit to the area will bear literary fruit. Setting off on his journey with an old friend, Tsumura, he soon finds that he’s not the only one with a reason for heading out into the countryside. Tsumura reveals that he’s been this way once before, and he’s making the return journey with a very special purpose, namely to see if a certain woman might look fondly upon him. This, then, is a story within a story, as the young man retraces the path of his ancestors to look for love and the place his ancestors came from. As I listened to this account, I gazed at the pearl of dew in my hand. It was as though the mystery and the sunshine of the mountains had congealed on my palm. I have heard that country people visiting the capital used to take packets of soil home with them as mementos: and if someone were to ask me about the color of the autumn at Yoshino, I think I would take some of these persimmons home to show. There are several nods to the writer’s other works here, with the descriptions of traditional paper production reminiscent of Tanizaki’s ideas from In Praise of Shadows and the fascination with traditional plays reminding the reader of young Jun’ichirō’s formative years in Childhood Years: A Memoir. However, even if you’re not a Tanizaki expert, Arrowroot can simply be read as a charming love story with a traditional setting, one where you could almost forget what century you’re in. This volume tells the story of the Lord of Musashi, born in the sixteenth-century Period of Civil Wars and known everywhere for his cunning and strength. He was the boldest, cruelest leader of his age. But those close to him said that he had masochistic sexual desires. Could this be true? The story is told by an unnamed writer who draws on two historical sources to bring the figure of the fearsome lord to life, and it begins with a portrait of the sexual deviant as a young man, living as a hostage at the castle of a major clan. During a lengthy siege, he manages to see a young woman cleaning the heads of the enemy notables, and when she explains why one of them is different from the rest (and when he sees how lovingly she tends to it…), the young Hōshimaru decides to please her by finding another head himself – and having a momentous impact on the siege while he’s at it. This string of clichés does not make clear how beautiful she may actually have been. However, he soon gets back to the action, and there’s certainly a lot to get through. An enthralling tale of history, bloody battles and base betrayal, The Secret History… also steps behind the historical curtain to show us what one of these adrenalin-charged warriors got up to in private, with scenes that are equally as amusing as they can be twisted.